I’ve been on service trips before, but this one was just a little bit different. I traveled to Pulaski, Va. this past week, not knowing what to expect. I came back having met amazing people, made many new friends and, most importantly, done work for very deserving people. 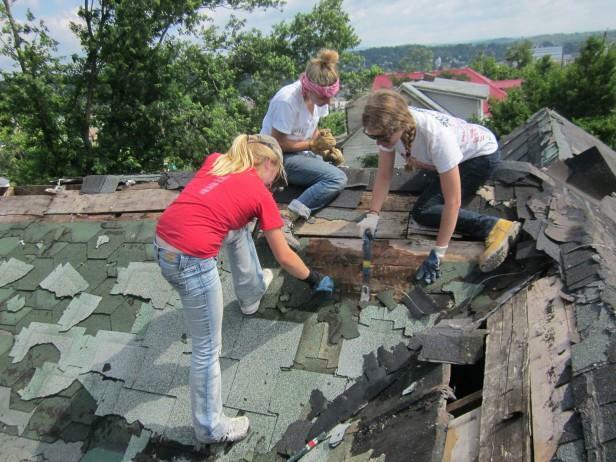 Sophomore Anna Volkov (left) and juniors Corinne Lake (center) and Melanie Goldberg remove shingles from the roof of a condemned house in Pulaski, Virginia. The Whitman Relief Network club traveled to the town June 19 to 24 to aid rebuilding efforts after a disastrous tornado in late May. Photo courtesy Melanie Goldberg. Over 60 students from the Whitman Relief Network club went to help the devastated town recover from a tornado in late May. I had seen most of the kids on the trip walking the halls before, but I had barely ever talked with them. On the first day, I was only friends with a handful of them. But by the last day, I was friends with so many of the kids who I had never bothered to talk to before the trip. Pulaski is not a wealthy town like Bethesda; in fact, it feels like you’re on a whole other planet. The center of the small town has several run-down factories and a strip of fast food restaurants. There are no million dollar mansions, and people don’t drive fancy sports cars. Many of the people are impoverished and were hurt even more by the disastrous tornado. Another rewarding part of the trip was meeting so many thankful people in Pulaski. One morning, we worked in a yard that had brush all over it. We took the brush scattered all over the yard and sorted it into piles. It seemed like tedious work at the time, but we later learned that it was an extreme fire hazard to have dead trees lying around. Blu, the owner of the yard, sat at the top of the hill watching all of us work. I thought I would go up and talk with him. He told me that he had been living in his house for 45 years and that he had raised all his children in it. We talked about sports and about how devastated the town of Pulaski was after the tornado. One of my highlights from the trip was the smile on Blu’s face when I went to shake his hand at the end of the day. We also went to a minor league baseball game one night. During the game, the announcer came on the PA system and expressed his gratitude for the work we were doing. The hundreds of people in the stadium proceeded to stand up and clap. At that moment, I realized how grateful this town really was for our help. After that, when I was walking around the ballpark, many people stopped me and expressed their gratitude. One kid even stopped me to thank me and asked me how I liked Pulaski. All in all, the trip was a great experience, where I met so many new people and did great work for a great town. I will not hesitate to go on the trip again next year to help another deserving community. Yeah, that moment at the baseball game was really touching. I remember also talking to a cashier at the Dollar Store, who, though not personally affected by the tornado, was very appreciative of what we were doing. Yeah, I remember Blu. At one point he went and fetched a saw from his house because we only had one. Nice guy.